USCIS biometric service fee of $85 for form i-539. Biometric appointment mandatory. Parent can sign form i-539A for kid under 14 yrs. H4 processing time increase. 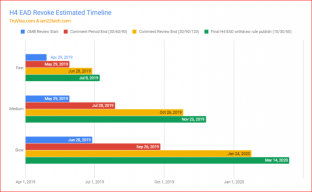 H4 EAD Revoke Estimated Time 2019 baed on OMB review, Public comments period of 30 days. Fast removal by June 2019 with slow till feb 2020. Lawsuit may stop. 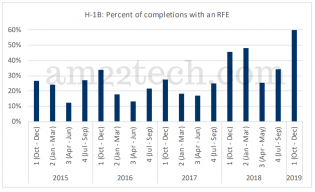 Indian EB2 Green Card priority date may just go upto Feb 2019 in USCIS season from Sep 2018 to Aug 2019. 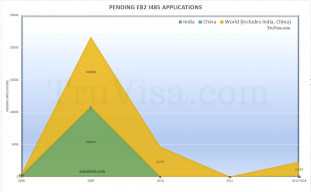 10k+ Indian i485 applications pending from 2009! 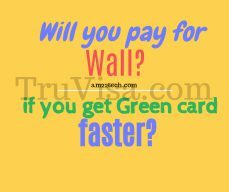 Trump has tweeted that his government is coming with a concrete plan to design path to citizenship (not even a green card) for H1B visa holders. 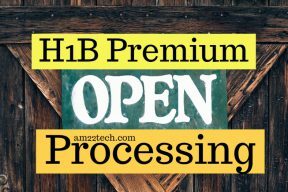 H1B Premium Processing April 2019 open for cap-subject H1B Change of Status application only. Consular processing can upgrade to premium in June 2019.